Global occurrence: Africa (incl Madagascar) | Eurasia – Asia Extratropical | Oceania – Australasia | Eurasia – Europe | Americas – North America (incl Mexico) | Americas – South and Central America | Eurasia – Asia Tropical | Arctic. Substrate: soil, clay, humus, turf, detritus, dead leaves | bark, cork, plant surface – trunks, branches, twigs | rock – siliceous, siliciferous, acidic | rock, stones, pebbles – unspecified. 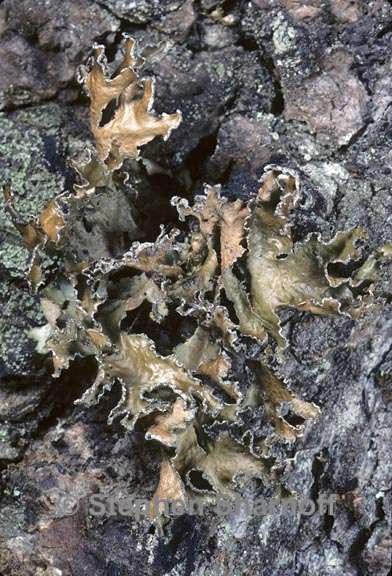 Life habit: lichenized (mutualistic with algal photobionts). Thallus: foliose (foliaceous), leaf-like; thallus: continuous, diffuse, effuse; [th] upper surface: grey(ish) | green(ish) | brown(ish) (if pale: fawn, tan; if mid: cinnamon) | brown(ish) green (olivaceous, olive green) | green(ish) brown (olive brown); [th upper surface]: epruinose; [th marginal and upper surface] specific structures: present; [th margin] cilia, cilioid structures: absent; [th upper surface] isidia, isidioid structures: absent | present; [th upper surface] soredia, soralia, soralioid structures: present; [th] morphol substructures (eg areoles, lobes, branches) width [mm]: (low) 2.0 (high) 10.0; [th] morphol substructures (eg areoles, squamules): contiguous, coherent (throughout the thallus); [th] morphol substructures (eg areoles, lobes, branches) upper surface: smooth, plane | rugose, plicate, folded, pustulate, faveolate, wrinkled | pseudocyphellate, with pseudocyphellae; [th] lower surface: brown(ish) (if pale: fawn, tan; if mid: cinnamon) | yellow(ish) white (ivory, off-white, cream-coloured); [th lower surface] specific structures: absent | present; [th lower surface] rhizines, rhizoid structures: present. Ascomata: absent | present; ascoma: apothecial, apothecioid – hymenial; ascoma [mm]: (median) 2.0; ascoma: sessile, superficial; [ascm, if apoth] margin surface; [if perith] periostiolar area, ostiole, involucrellum: green(ish) | brown(ish) (if pale: fawn, tan; if mid: cinnamon); [ascm, if apoth] margin excipular photobionts: present; [ascm, if apoth] subhymenial layers, hypothecium; [if perith] basal excipulum: hyaline, colourless; [ascm] paraphyses/-oids: present; [ascm] epihymenium, epithecium: brown(ish) (if pale: fawn, tan; if mid: cinnamon) | red(dish) brown (pale: orange brown). Asci: lecanoralean; [asc] tholus: thickened; [asc] tholus amyloidity (iodine reaction): present; [asc] tholus amyloidity pattern: amyloid with widening axial body towards the apex (= Lecanora-, Parmelia-, Rinodina-types etc). Ascospores: (median) 8.0; [asp] shape: globose, spherical | ellipsoidal; [asp] length [µm]: (low) 4.0 (high) 10.0; [asp] width [µm]: (low) 2.5 (high) 6.0; [asp] septa: absent – spore lumen unilocular, monolocular; [asp] pigmentation: hyaline, colourless; [asp] perispore, epispore: not apparent. Secondary metabolites: present, protolichesterinic acid. Primary photobiont: present, chlorophytaceous – trebouxiaceous, chlorococcoid. Secondary photobionts (eg in cephalodia): absent. Thallus: foliose but often somewhat ascending and subfruticose, up to 5 cm in diam., +orbicular or often irregular lobes: rather elongate but of irregular width and the edges often rather sinuose, 1-2 mm broad, flat to weakly canaliculate, prostrate or more often loose and ascending upper surface: tan-brown or brown (pale olive-brown in some shade forms), occasionally dark brown in part, epruinose, usually +dull but sometimes rather shiny on the lobe ends; sorediate soredia: usually granular but rarely proliferated and isidioid, brown to dark brown (but often eroded revealing the white medulla), in marginal (rarely laminal), linear and elongate soralia, occasionally with a few weakly recurved regions upper cortex: paraplectenchymatous medulla: white lower cortex: paraplectenchymatous lower surface: almost white to pale tan or pale brown in part, often +smooth in younger parts, usually becoming weakly rugose, dull to weakly shiny, especially in younger parts; rhizines: sparse, often nearly absent in peripheral areas, +concolorous with the lower surface Apothecia: marginal or terminal, rare (not seen in Sonoran material), up to 2 mm broad; margin: crenate-papillate ascospores: globose, 5-5.5 µm Pycnidia: black, uncommon, mostly marginal, emergent (± as tall as broad) conidia: bifusiform, 4-5 x 1 µm Spot tests: all negative in cortex and medulla Secondary metabolites: lichesterinic type fatty acids. Substrate and ecology: on bark, wood, or rock World distribution: North America, Europe, South America, South Africa, and Australasia Sonoran distribution: seen only in Santa Barbara Co. and Santa Rosa Island in southern California, and Guadalupe Island in Baja California. Notes: The marginal linear soralia make Tuckermannopsis chlorophylla a distinctive species, that is not easily confused with any other cetrarioid lichen. 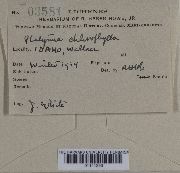 It might possibly be confused with Melanelia subargentifera or M. albertana, two brown species with similar coloration and soralia, but both species are distinctly C+ red in the medulla (lecanoric acid).